For a while now, I’ve wanted to do some fan art for Spider-Man : Into the Spiderverse. I have seen very few films that I would consider as good as SMItSV, and even fewer animation films. I’m a huge fan. I’ve always been a fan of Spidey. He, in my opinion, opitimizes the contrast between DC’s “Gods among men” vs. Marvel’s “Human’s with powers”. Peter’s just a kid when we first meet him. He has troubles talking to girls, getting his homework done, and still he manages to rise above and do the right thing when the time comes. Most of the time. Because if he always succeeded, that wouldn’t be very human. But that’s the important part – he rises again after he fails. He knows he has to continue the fight against evil – that it’s the right thing to do. Without spoilers, I’ll just let it suffice to say that in all the subtle ways that really matter to me, they got Spidey right in the movie. Whichever version you’re talking about. Because that’s the thing – there are core elements that are Spider-(Wo)Man. But it’s not an easy thing to put down on paper. Still, they managed to create a multiverse of them. So ever since the film came out, people have been creating their own contributions to the idea of the Spider-Verse. 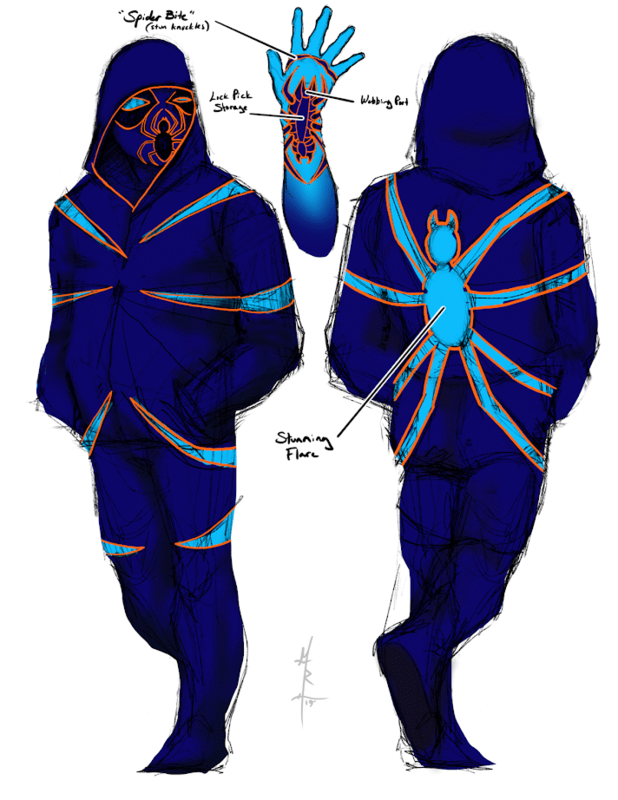 Many/most with the idea that this is how they envision themselves in a world where spider based powers exist. Well, I found myself with a few minutes to come up with a concept for myself. I’m a bit of a tech toy nerd, so I built that into my Spider-Verse gauntlets. I’ve always preferred the ‘stealthier’ versions of Spidey’s costume (Black Suit 4 EVA!) so I went with a tech/stealth design. And while I was on the stealth end of things I thought that some lock picks might be a good idea and a light on my back to blind opponents is another way to use very simple tech to best advantage. This is, sadly, only a super fast / rough sketch of a concept, but maybe I’ll do a more refined drawing when I have more time. I just had to get myself into the Spider-Verse as soon as possible! Tagged art, color. Bookmark the permalink.